Points Needed: 15850 Software is not compatible with mobile and tablet devices. Please add this title to your Wish List and sign on to your the first club account from a desktop computer to complete your redemption. ABOUT PRODUCT Get in the producer's chair and take control. 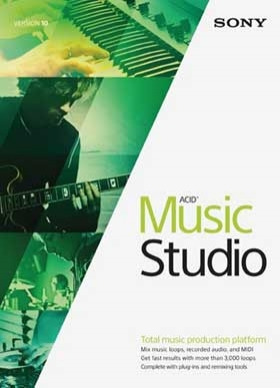 ACID Music Studio is the ideal gateway for you tostart producing music. It's easy—drop a beat on the timeline and dig in. Put the software towork and take advantage of all the production tools you need to make the music you've alwayswanted to hear. Keep it simple or go deep—ACID Music Studio has everything you need whenyou're ready … to take it to the next level. With built-in tutorials to guide you, you'll be composing,editing, and mixing like a pro in no time. FEATURES Studio multitrack recording – including bit depth/sample rate increase to 24-bit/192 kHz Pick your music and explore 3000 loops and 90 virtual instruments Exclusive guitar and piano software bundle – including TruePianos Amber Lite and Studio Devil BVC Studio-quality audio effects and enhanced remixing tools – with élastique timestretching and the Beatmapper tool	TECHNICAL DATA Microsoft Windows 7, Windows 8, Windows 8.1, or Windows 10 1 GHz processor 200 MB hard-disk space for program installation 1 GB RAM Windows-compatible sound card Supported CD-recordable drive (for CD burning only) Microsoft DirectX 9.0c or later Internet Connection (for Gracenote MusicID Service) Online registration is required in order to activate the software.